The air transport industry has seen a rapid growth since the early 1900s and continues to be a driving force in the development of civil aviation and airport operations in Singapore . Over these years, Singapore saw the development of three airports, namely Seletar Airport , Kallang Airport and Paya Lebar Airport , to cater to the unprecedented demand for air transport / travel. Experiencing the strain in handling four million passengers per year, the Singapore government made a decision in 1975 to build a brand new airport at Changi to replace Paya Lebar Airport . Spanning an area of 1,300 hectares, Singapore Changi Airport is located at the eastern tip of Singapore , some 20 kilometres from the city centre.Located along the coastal line of the island, there is minimal noise pollution as flight paths are generally over the sea. More than half of Changi Airport 's total land was reclaimed from the sea. To make way for the construction of Changi Airport in 1975, almost 200 hectares of swamp land area were cleared. In addition, 12 million cubic metres of earth from nearby hills were removed to fill the swampy ground. Reclamation from the seabed was done using seven cutter-suction dredges round the clock. The sand mixed with water was pumped direct from the dredging sites to the reclamation area. The job was completed within 29 months and more than 40 million cubic metres of sand were used from the seabed. Phase 1 development of Changi Airport included the completion of the passenger terminal building 1, a runway, 45 aircraft parking bays, a huge maintenance hangar, a fire station, workshops and administrative offices, an airfreight complex, cargo agents buildings, in-flight catering kitchens and a 80-metre high control tower. With Phase 1 completed in 1981, Phase II development started, comprising a second runway, taxiways, 23 aircraft parking bays, a second fire station and a third cargo agent building. The construction of Terminal 2 followed in 1986, which included the associated roadways, two multi-storey carparks, a people mover system (Changi Skytrain) and a baggage transfer system between the two terminals. Terminal 1 commenced operations on 1 July 1981 and was officially opened on 29 December 1981 . It operates independently from Terminal 2, handling the flow of arriving, departing and transit/ transfer passengers on international and regional flights. The structure of Terminal 1 followed the centralised terminal concept consisting of a main five-storey block connected to four finger piers. Terminal 1 has undergone one major refurbishment since its opening to include the extension of two of the finger piers . Expansion works for Terminal 1 also began in December 1995 with an additional 14 aerobridge gates, bringing the total number of aerobridge gates in Terminal 1 to 33. Terminal 1 has an annual handling capacity of 21 million passengers per annum. Plans for the next upgrading programme are in the pipeline. 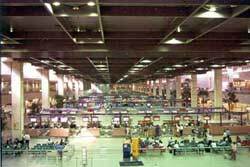 Terminal 2 commenced operations on 22 November 1990 and was officially opened on 1 June 1991 . Terminal 2 operates independently from Terminal 1, serving mostly Singapore 's two national carriers namely Singapore Airlines and its subsidiary, SilkAir. The structure of the building followed a centralised terminal concept, concentrating facilities and services in the main complex of the six-storey building. A terraced multi-level ceiling is designed to allow natural light to filter in, giving the Departure Hall a warm and cosy ambience. In July 1996 two additional finger piers at Terminal 2 were officially opened. Costing $330 million, the expansion project involved the construction of the two finger piers to provide an additional 22 aerobridges, bringing a total of 34 in Terminal 2. Terminal 2 has a current annual handling capacity of 23 million passengers per annum. Terminal 2 is currently undergoing upgrading at a cost of S$240 million. When completed in 2005, the upgrading will add capacity to the departure/transit louge, enhancing Changi's position as an aviation hub in the region. Construction work for Changi's third passenger terminal, Terminal 3, commenced in October 2000. Terminal 3 will be designed for an annual handling capacity of around 20 million passengers, bringing the total handling capacity of Singapore Changi Airport to 64 million passengers per year. Well-connected by two major expressways, the East Coast Parkway and Pan Island Expressway, travellers and visitors to the airport will be able to reach the other parts of Singapore with much ease and convenience. Coupled with Singapore 's extensive and free-flowing road network system, the city is almost a doorstep away from the airport with a mere 20 minutes drive. The ground access to and from Changi Airport is further enhanced with its connection to the island-wide rail network system (Mass Rapid Transit) . With over 35,000 airport staff, Changi Airport is committed to serve the needs of our passengers with the most advanced facilities and world class services. The strong and cohesive working relationship among the airport agencies - the Singapore Immigration and Registration, the Customs and Excise Department, Airport Police, ground-handling agents, contractors and concessionaires, is the impetus that strengthens Changi Airport 's premier hub status in the region. 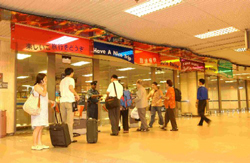 Changi has achieved a consistent record of accolades. These successes have been due, in no small measure, to the foresight of those guiding the development of civil aviation in Singapore , to the relentless pursuit of a liberal air policy to open up Singapore to the rest of the world and to the emphasis on competitiveness, efficiency and service. Since commencing operations on 1 July 1981 , Singapore Changi Airport has never failed to receive a deficiency-free rating by the International Federation of Airlines Pilots Association (IFALPA) for its safe and efficient air traffic services.